The Biosecurity Blitz runs from 19 October to 16 November 2018. It is an opportunity to report marine and freshwater pests. Aquatic pests and diseases are a significant threat to Western Australia’s precious oceans and rivers. We are leading the effort to prevent them arriving and establishing themselves in our waters with a multi-million dollar aquatic biosecurity program using cutting edge technology, and ground-breaking management and compliance strategies. Aquatic pests can be transported by ocean-going vessels, and by escaping or being released into our rivers and dams. Pests and diseases can devastate aquatic ecosystems damaging economies, environments and lifestyles. WA’s industries and the community are essential partners in the fight to keep our waters pest free. We are also working at a national level to prevent the spread of pests and diseases in the nation’s waters. 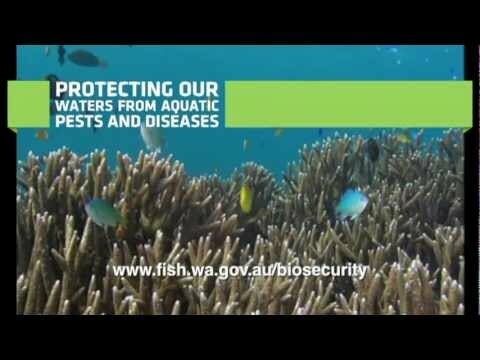 The Department’s Aquatic Biosecurity Policy outlines the Department’s management of aquatic pests and diseases to ensure aquatic environments within WA are biosecure.